You’ve done all that sleep habits stuff to make your child go to sleep or stay asleep. Nothing worked. Now you’re desperate enough to try some natural sleep aids for children but you don’t know where to begin. There are more natural sleep aids in the stores than there are prescription sleeping pills. 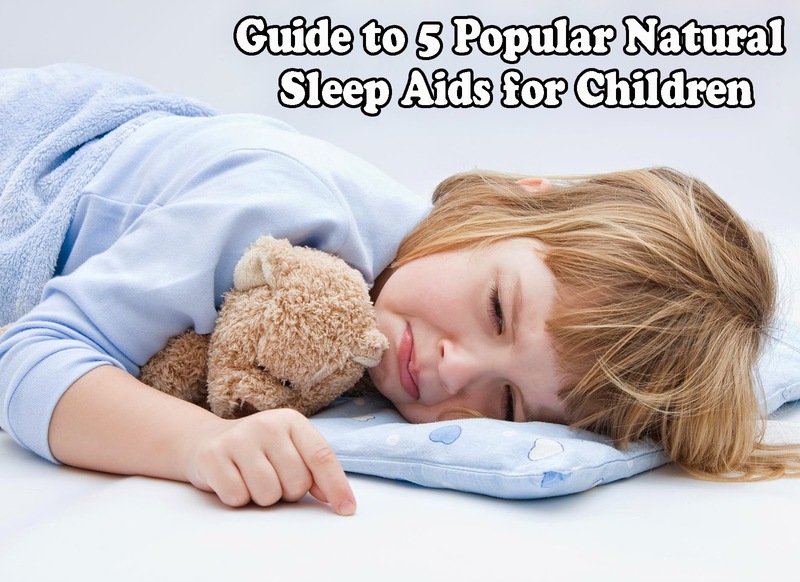 Here’s a fast and easy guide to 5 popular natural sleep aids for children. It’s a hormone secreted from the pineal gland in our brain. Thought to help our bodies’ sleep-wake cycle i.e when it’s time to go to sleep and when it’s time to wake up. Melatonin decreases the time it takes to fall asleep (“sleep latency”), and may increase the duration of sleep. » Dosage should not exceed 3 milligrams and it’s not recommended by healthcare professionals to give to kids younger than 10. » It must be noted however, nearly all studies of melatonin were on “special needs” children i.e. autism, other development disabilities, blind. Their bodies either don’t produce melatonin or do so only erratically. It’s one of nature’s oldest herbal sleep aid used for centuries. It is also one of the gentlest herbs making it so popular as a children sleep aid. The active ingredients are flavonoids namely, chrysin and apigenin, believed to reduce restlessness helping one feel more relaxed and more prepared to sleep. » It also has anti-inflammatory and anti-bacterial properties. That’s why it’s also popularly used in cases of stomach irritation. » Safe for both adults and children. It does not lead to dependency and has not been shown to have any side effects. However, it may cause allergic reactions in people who have plant or pollen allergies. » Known as a ‘plant doctor’ stimulating the health of other plants, you will find it popularly combined with other herbs to make standardized herbal remedies.However, this also means you have to use with caution if your child is on other drug therapies. It may increase the effects of other sleep aids. » A herbal sleep aid that is also one of the top 3 popular OTC sleep aids for children. Its active ingredient is still unclear therefore how it works is unclear too. » Generally thought to help reduce the time to get to sleep and possibly improve sleep quality. » Generally safe when taken in recommended dosages. However, high doses of valerian can cause nausea, headaches, dizziness, vivid dreams, weakened heartbeat and even paralysis. » It works well in combination with other sedative herbs. Valerian and lemon balm preparation is the most popular combo sleep aid for children since a study done in Germany showed fast and significant improvement for children under 12 with restlessness or dyssomnia (sleep disorder). It’s an aromatic mint plant recognized by European herbalists for its ability to help induce sleep and ease nervousness. In Germany, lemon balm preparations have been approved for treatment of nervous insomnia. » It also protects the gastrointestinal tract against ulcers. Therefore, lemon balm is a popular remedy for insomnia accompanied by a nervous stomach. » Taken as a tea, lemon balm is quite tasty. » When used as a sleep aid for children, the dosage according to the German study are valerian and lemon balm tablets with 160 mg of valerian root dry extract and 80 mg of lemon balm leaf dry extract. » It is not associated with any toxicity or side effects. This herb, used by the Aztecs as a sedative, helps relax the mind and body to induce restful sleep. The active ingredient, harmine, and related compounds help inhibit the breakdown of serotonin. It also contains chrysin, the same flavonoid found in chamomile. It is an especially helpful sleep aid for sleep disorders caused by chronic pain, muscle conditions and anxiety. » Taken as a tea, tincture or as capsules. » Safe for use as either a sleep aid for children or adults. However, because the most common side effect of passion flower is drowsiness, don’t take it unless you plan to sleep for while. Now that you know these 5 natural sleep aids for children, always consult a licensed healthcare provider first if you are thinking of using any of them for your child. Also, you should tell your healthcare provider about all of the supplements and medication your child may be taking so that he can evaluate any potential drug-supplement interactions.